Pocket CFO – Profiting from financial statement course is a mobile application, which is designed to give insight and relevant information to the investor. It is a powerful mobile learning application for the individual investor to understand the financial statements properly. The application course is fully featured with text course book, comprehensive tests, review flashcards, and practical examples. This application is designed by Intersog in order to help investors to get maximum profits on their investments by understanding the issues. The course structure of profit from financial statement course is completely based on highly experienced professor and best-selling author Dr. Jae K. Shim. 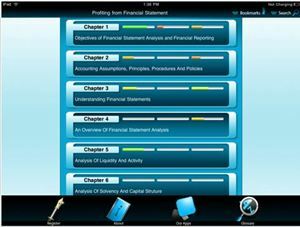 The Pocket CFO – Profiting from financial statement course is available to download for free from app store. It is compatible with iPad running on iOS 3.2 or later. If you find it really useful then you can download and use.